There’s a certain bunny on the loose. You know, the one who plays hide and seek with yummy treats! Legend has it, only a few persistent peeps have ever seen him. Well today you could be one of those folks, and have the picture to prove it! Come join us for “Bunny Bounty” – a fun, interactive Augmented Reality game. 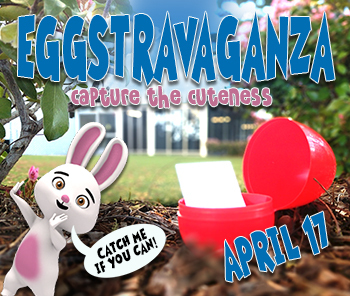 Think egg hunt with a twist! Agency West is always looking to elevate our offerings and expand our experience-making toolbox. Augmented Reality, or AR, is quickly becoming something that the public at large can experience in many different ways: tradeshows, print campaigns, and movie theaters. The possibilities are endless. Your participation in this event and feedback are key to helping us learn and move towards making “Augmented Reality” a reality for future VSP-sponsored events. Agency West will be documenting everything and will share a video sometime after the event. Now for the fun part! So how do you capture the cuteness? If your egg has a card inside, hold it up to your phone camera. If the bunny appears, try to center him on the card. 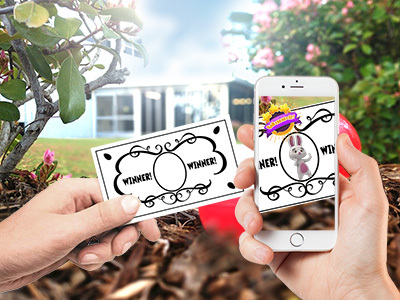 If you’ve got a winning egg, the bunny will do a happy dance and a winner badge will appear. If the bunny darts across your screen, keep hunting! Select the URL bookmarked on your phone. Click “allow” to give the game access to your camera. Hold your phone vertical to calibrate your camera for the “Augmented Reality” experience. Once your camera is calibrated, the “Bunny Bounty” home screen will appear. Tap the > button to start playing.